Type 2 diabetes is a condition that causes a person’s blood sugar (glucose) levels to become too high. It can cause symptoms such as excessive thirst and needing to pee a lot, but left untreated, complications can develop such as eye problems, kidney problems, nerve damage, heart attack and stroke. One of the best ways to manage your blood sugar level so you can both prevent and control type 2 diabetes is to follow a healthy diet. The NHS recommends you eat a wide range of foods, including fruit, vegetables and some starchy foods like pastas and to keep sugar, fat and salt a minimum. But individual foods have also proven effective at lowering blood sugar. Several controlled studies have shown the spice cinnamon can lower blood sugar levels and improve insulin sensitivity. One study demonstrated type 2 diabetes patients who took cinnamon for 90 days had more than a double reduction in haemoglobin A1C (a form of haemoglobin that is covalently bound to glucose) than those who only received standard care. 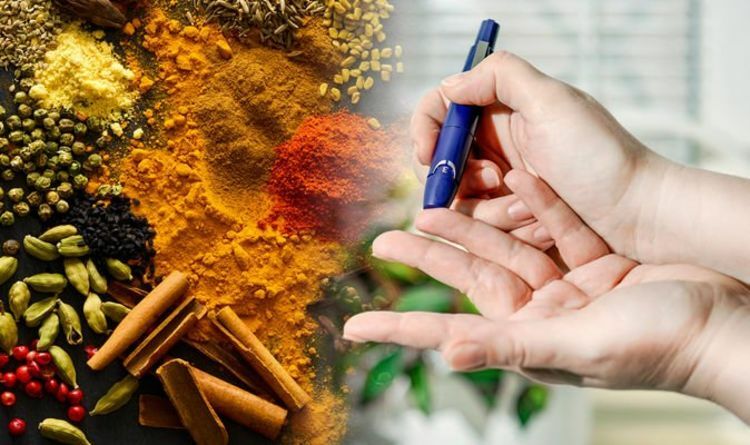 The study was titled ‘Effectiveness of cinnamon for lowering hemoglobin A1C in patients with type 2 diabetes: a randomized, controlled trial’. In three trials involving cinnamon cassia, fasting glucose levels fell by between 10.3 per cent and 29 per cent with no significant changes in those on placebo. Cinnamon can be found ground, in tea or supplement form. But it should also be noted some studies have failed to show cinnamon’s benefits on blood sugar. A study titled ‘The effect of cinnamon cassia powder in type 2 diabetes mellitus’ demonstrated this. Healthy eating isn’t the only way to prevent and control type 2 diabetes. Experts also recommend doing physical exercise to help lower your blood sugar level. You should aim for 2.5 hours of activity a week. But what are the best blood sugar-lowering exercises to do? There are many exercises that will benefit people with diabetes, says the Cleveland Clinic, but one it recommends is swimming. As well as stretching and relaxing your muscles, swimming doesn’t put pressure on joints, which can be good for people with diabetes. It adds: “For those with diabetes or at risk for developing diabetes, studies show it improves cholesterol levels, burns calories and lowers stress levels. “To get the most benefit from swimming, we recommend that you swim at least three times a week for at least ten minutes and gradually increase the length of the workout. Yoga and Tai Chi could also prove effective exercise for type 2 diabetes. John Wick's National Puppy Day Trailer Shoots Right To The Heart PS4, Xbox and Nintendo Switch release date for new game from Pokemon dev revealed?